Which new fall TV series are you most excited about? 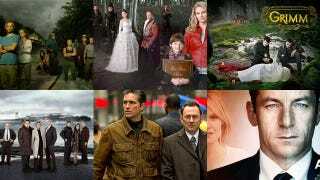 Upfronts are over, and we've seen some of the best (and worst) of the future of fall TV 2011. But which particular show are you most excited about? Which new genre series has topped your must-watch list? Vote now! All of the inhabitants from fairy tale land are mind wiped and thrown into reality. Now it's up to one woman to save them all. Ginnifer Goodwin plays Snow White (now a sad, pixie-cut nun) and Robert Carlyle plays some evil goblin. TV explorer and family man Emmet Cole (Bruce Greenwood) goes missing in the Amazon. Now it's up to his family to find him... mockumentary-style. Lots of scares and plenty of mysterious vodoo. Produced by Steven Spielberg and Paranormal Activity's Oren Peli. Michael Emerson is the brains. Jim Caviezel is the muscle. In Person Of Interest, they band together to stop crime before it happens. Produced by J.J. Abrams and penned by Jonah Nolan. Patrick Wilson's strange series about a surgeon who's contacted by his dead ex-wife. Instead of exorcising the evil ghost, he listens to her banshee shrieks, and becomes a better person. A batch of hardened Alcatraz criminals have disappeared from time, and reappeared in the present day (without aging a day) and they're up to no good! Quick, someone call Sam Neill and Jorge Garcia. Produced by J.J. Abrams. First Trailers for J.J. Abrams&apos; Alcatraz, plus Grimm and Awake! A family flees their dirty dystopian future Earth and travels back to the land of the dinosaurs to start over (and hopefully find the nature/science clue to save their future but mostly to play with dinosaurs we assume). Tim Kring (Heroes) latest series in which all of the characters (from around the globe) are mysteriously linked. From the author of the Vampire Diaries comes The Secret Circle, a show about witches (and teenage love triangles) so year Vampire Diaries with magic. A detective discovers that he's part of a secret fairy tale hunting order called "the Grimms" (like the Brothers Grimm). He then goes out and kills a bunch of people that are secretly trolls and solves magical crimes! Jason Issacs plays Detective Michael Britten, who has been in a terrible accident with his wife and son. From that tragic day on, his character begins living in two different realities. In one, his wife died and son survived the crash; in the other, his son died and his wife survived.